There are many free resources for learning how to play the banjo online. There are many websites that give you lots of free lessons and technique instruction. For more in depth learning, you have to do have to pay, as with most online lesson websites. The nice thing about getting lessons online is that you can do them at home, on your own time. I have some free learning tips, instructional videos found on utube, and helpful resource information below for the newbie to help get you started. Have fun with your new banjo! The "roll" is a fast finger picking technique with your thumb, middle and index fingers in a pattern while the left hand frets the chords. This can be done throughout a song, sometimes changing the rolls pattern sequence for variety or accent in the song being played. The roll is perfect as a vocal accompianment or for background playing within an ensemble. It is often called "Scruggs Style" because, of course, he made it famous, and is the most recognizable sound in bluegrass music. This inovation differs from the clawhammer or "frailing" style, which uses 2 fingers, the the thumb and fingernail of either the index or middle finger. For the roll, you will have a pick on the thumb, middle and index, with the non-playing fingers (ring and pinky) out of the way resting below in a supporting position on the banjo head. The most common roll pattern is thumb, index, middle, (etc, etc etc). The string sequence is 5-3-1-5-3-1-5-3 (for a full measure). Strings are numbered 5 for the top string, 4 next, and so on. There are other patterns, like the backward roll (middle, index, thumb), the mixed roll and a forward-backward roll. I would start practicing the standard roll after you have mastered strumming your basic chords, and can easily change chords, along with some easy songs. When you can maintain your rhythm while changing chords, and have built up good dexterity and endurance in your fingers, you should be able to start learning a roll. Practice with open strings until you can successfully pick the strings (in the right sequence) easily and with increasing speed. Once you can do that, begin with a chord, then add another, etc; until you can manage 3 chord changes with the roll pattern. That will get you through many songs in bluegrass music! Pick out a song or two that you like and start playing along. A few well known songs with the distinctive roll being played that you can practice with are Foggy Mountain Breakdown and the famous theme to the TV show, The Beverly Hillbillies, The Ballad of Jed Clampett. You can also play along with the many video songs available on the net, or play with a friend who might have a guitar or mandolin or fiddle. If you or a friend can carry a tune, you are in business, and can begin the journey of being a banjo player! It's a lot of fun...just remember not to try to learn to much too fast..that usually ends up in frustration and quitting! Learn your chords first; practice them over and over so you can switch between them easily while strumming and without looking at your hand. Then begin playing a song, just the chords (if you can't sing, at least work on humming the melody while you play). There are hundreds, at least, of songs for the banjo that only use 2 or 3 chord changes. Practice a song until you know it backwards and forward, and when you can do it well, start looking at the music notes. They will begin to make more sense after you know how to play a songs chord changes and know it's melody. I guarantee you will then start to make sense of the written music. Here is a good site with the basics to help you: Introduction To Reading Music. The most important thing is that you do not become so frustrated that you stop trying to learn. The best way to avoid that is to start out learning to play easy songs that you are familiar with, especially those you like. Learn the chord changes, sing or hum along and whenever you can, play with others, or ask someone else to sing the melody while you play. Don't worry about your own voice, keep at it..you will improve with time. If you can find a video of a musician playing the instrument you are learning, and can see their hands clearly, try to play along with the video. You can learn a lot from watching other musicians play! There are tons of good websites and videos out there to help you, and they are free! There are several styles of banjo playing techniques (generally the act of playing the banjo is called “picking”) and the terms used describe the direction or method of the hand/fingers to strike the strings. Often, players will use a combination of styles, and the more advanced you are the more you can vary your playing to include melody as well as strumming chords. The clawhammer style is a rhythmic downward movement across the strings, with the hand in a “claw” shape, the back of the fingernail(s) making the contact with the strings. 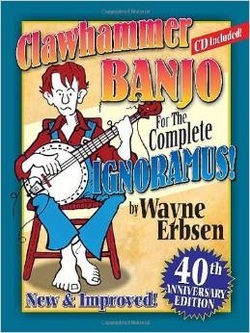 The open backed banjo is most commonly used for traditional American folk, Irish or country music and is best suited for the clawhammer style. It's sound can be rhythmic and harmonic (even percussive with raps on the banjo head) and is a great addition to group playing. Add a violin (fiddle) and you have a mountain band! I like strumming along with mandolin, it's easy and is a lot of fun!. The “finger picking methods”, most often used in bluegrass have the thumb plunking on a downward motion and the the fingers picking up on the strings. This is typical of the 3 finger style made famous by Earl Scruggs. The different methods of picking a banjo are so numerous that for a newbie, it can be overwhelming. I would first start with learning the basics of claw hammer and basic finger picking, then through experimentation or listening to songs, find the sound YOU like best and go from there. I have put some very good instructional DVDs and books on this site, a source below for free instruction on the web. The best method of course is just plain practice. If you can find people to play with, join a group that is willing to accept a beginner. The more you enjoy it, the more you will play, and the more you play the more you will learn to get better. Below are a few good video lessonsI found on YouTube.